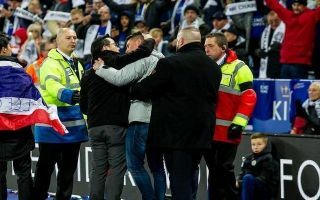 A Leicester fan who jumped over the barrier to go onto the pitch and hug Vichai Srivaddhanaprabha’s emotional son has been banned from the King Power Stadium. According to a report from The Sun, Foxes season ticket holder Tom Merry has been banned from going to the King Power Stadium for three months. 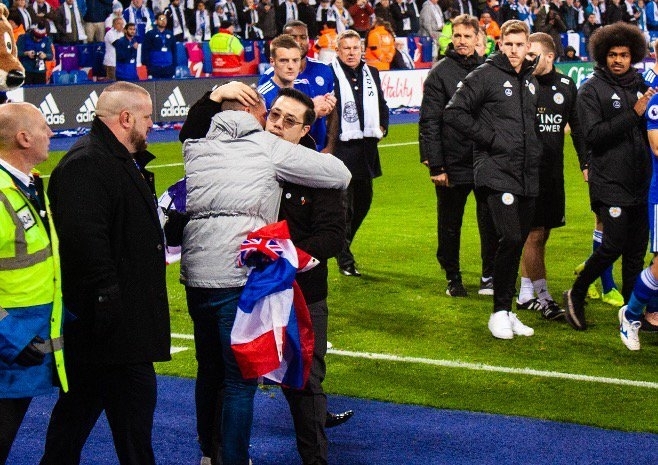 Merry ran onto the pitch to hug Vichai’s son ‘Top’ as he made a lap of honour with players and staff to thank fans for their heartwarming support and lovely tributes following the tragedy which saw Vichai Srivaddhanaprabha as well as four others lose their lives when the owner’s helicopter crashed just outside the King Power Stadium. The lap of honour was made at the end of Leicester’s first match back at the King Power against Burnley earlier this month. It’s clear that Merry ran onto the pitch with good intentions and it seems extremely harsh and inconsiderate to ban him from the stadium for three months. Security staff then charged forward to protect their boss and hauled Merry away. Merry was taken to a holding cell and the club have since written to inform him that he is banned from the King Power for three months. Leicester fans have since launched a petition for Merry’s ban to be rescinded and have set a target of 1,000 signatures.